In recent years, exchange traded funds, or ETFs, have become a common part of many retirement portfolios. They work much like mutual funds, but can be traded throughout the day and often have lower costs. But how do you know if an ETF makes sense for you? After all, there are literally thousands of ETFs available, all with unique characteristics and goals. Most financial advisers suggest that investors keep things simple by finding ETFs that track major benchmark indexes, such as the S&P 500. They should generally have low fees and fit in with other investments in your portfolio, too. Here are some key ways to determine if an ETF isn't right for you. Anytime you purchase a mutual fund or ETF, it's important to note how much of your money is going to fund managers and other expenses. High fees can take a big cut out of your overall earnings, and there's little evidence that ETFs with higher fees perform better than cheaper ones. It's possible to own very solid ETFs with expense ratios at 0.1% or lower. If your ETF's expense ratio is significantly higher, it may be time to invest in something else. "Anything above 0.3%, and it gets a little excessive," says Justin Halverson of Great Waters Financial in Minneapolis. As ETFs have grown in popularity, they've also grown in number — and complexity. That means there are many "boutique" ETFs with very unique philosophies and goals. There are ETFs that zero in on very specific industries or market sectors. There are ETFs that do elaborate things involving leverage, or track obscure indexes. For most investors, these ETFs are complicated and unnecessary. "You can get as fancy as you want with it," said Charlie Harriman, a financial adviser at Cloud Investments LLC in Huntsville, Alabama. "We usually advise that investors stick with the staples and things they know." Some of the unique ETFs mentioned above are designed to generate big returns in some cases, but there's a huge downside if markets go south. Some ETFs use leverage to potentially amplify returns by two or three times an underlying index — thus, they can amplify losses during downturns. The average investor who is saving for the long term does not need to take on additional risk with ETFs that are designed for short-term trading. It's important that your investments match up with your financial goals. This means that if you're a young investor, you probably don't need a bonds ETF, or an ETF with low-growth dividend stocks. These types of ETFs may help you avoid a big loss during a market downturn, but you'll never be able to amass the kind of wealth you need in retirement unless you get a bit more aggressive. Diversification is great, but sometimes you can go overboard. When you invest in an ETF, you are getting exposure to a wide range of stocks, and there may be other ETFs with similar holdings. For instance, an ETF that tracks the overall stock market may own a good chunk of Apple stock, and a tech-focused ETF may own a lot of Apple stock as well. So it may not necessarily make sense to own both. Be sure to check the list of holdings for each ETF you own in order to avoid redundancy in your portfolio. Many discount brokerage firms allow account holders to trade certain ETFs without paying a commission. For example, Fidelity allows fee-free trades for all ETFs offered by iShares. By eliminating this commission, you could save upward of $7 on every stock purchase, which is a lot of money if you make frequent purchases. This is particularly advantageous for younger investors who prefer to invest a little at a time rather than one large sum. If you're looking at an ETF to buy but it's not available without paying a commission, consider switching to a similar ETF that is. If your broker does not offer commission-free trades on ETFs, maybe that's a good excuse to switch brokers. Many ETFs are designed to track a specific benchmark index, such as the S&P 500 or Russell 2000. If they do what they are supposed to, your returns will be closely aligned with the performance of these indexes. But some ETFs do it better than others. It's easy to find an ETF's "tracking error," which measures the difference between an ETF's performance and the benchmark it's supposed to be tracking. Most ETFs will have a tracking error of less than a tenth of a percent. "If you see a high tracking error, this could work out to an investor's benefit, but it may also be to their detriment," Halverson says. The only way an ETF is sold is if there is a buyer. Likewise, you can't buy a stock if no one is selling. 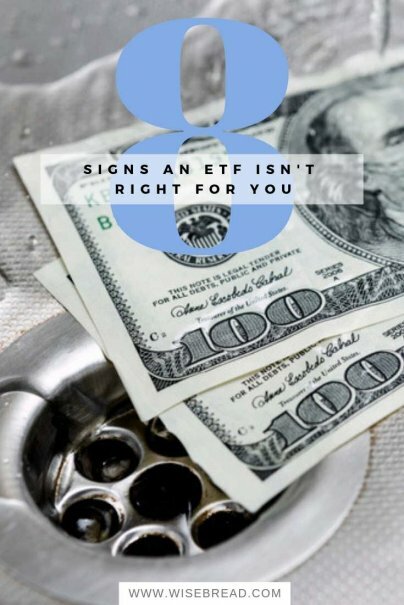 With most ETFs, it's easy to buy and sell because there is a large trading volume — meaning that there are plenty of buyers and plenty of sellers. And when there is a high volume, there is rarely a big spread between the "bid" and the "ask" prices. But what happens if an ETF has a low trading volume? Halverson said this could mean that the ask and bid prices are far apart, and it may be hard to complete a sale at the price you want. Most investors, he said, will find it easier and better financially to trade ETFs that are more commonly traded.